The jewelry world has encountered a new craze: coin jewelry. Beautiful, elegant, creative and playful, this jewelry is on its way to becoming this year’s biggest trend. But what exactly is coin jewelry? And, more important, where can you get it and how can you wear it? To find an answer to your questions before you buy fine jewelry metals, read further. We have prepared an interesting article about coin jewelry that will help you get the hang of this trend. Whether we are talking about jewelry that features coins or jewelry with coin-like shapes and motifs, coin jewelry is elegant and beautiful. Many years ago, both men and women would wear this type of jewelry to signal their social status, wealth and so on. Of course, many years have passed since then and nowadays we wear jewelry just because we love it. In truth, it’s a great change that we don’t feel the need to flaunt it anymore. Coming back to coin jewelry, does the name mean that this type of jewelry features actual coins? Not necessarily. It can, of course, but keep in mind that coins are not usually made of precious metals. And if you happen to have a gold coin which is more than a hundred years old, you wouldn’t want to put a hole in it and hang it from your chain necklace, would you? This is why most of the coin jewelry you can find either feature “fake coins” or simply coin-like pendants or motifs. The most popular coin jewelry nowadays are the necklaces. As you may know, ever since the end of last year Ana Luisa has started to feature beautiful coin necklaces. As you will discover, coin jewelry designs can be very different from one another. However, keep in mind that this trend is also incorporated in rings, bracelets and even earrings. So, without further ado, here is what coin jewelry you can get by visiting our online jewelry shop. For those of you who love coin jewelry, this is one of the classic pieces that will never get old. Featuring an artistic handcrafted Napoleon coin and a subtle but sturdy link chain, this amazing coin necklace is great to wear every single day. This coin jewelry by Ana Luisa also featured a detailed and artistic coin pendant. But, as opposed to the previous coin necklace, this one has a chain with oversized links and is great to wear to cocktail parties and other similar events. A great example of a coin jewelry piece that doesn’t feature a pendant that looks exactly like a coin, this beautiful and sleek necklace will draw attention to your neckline. 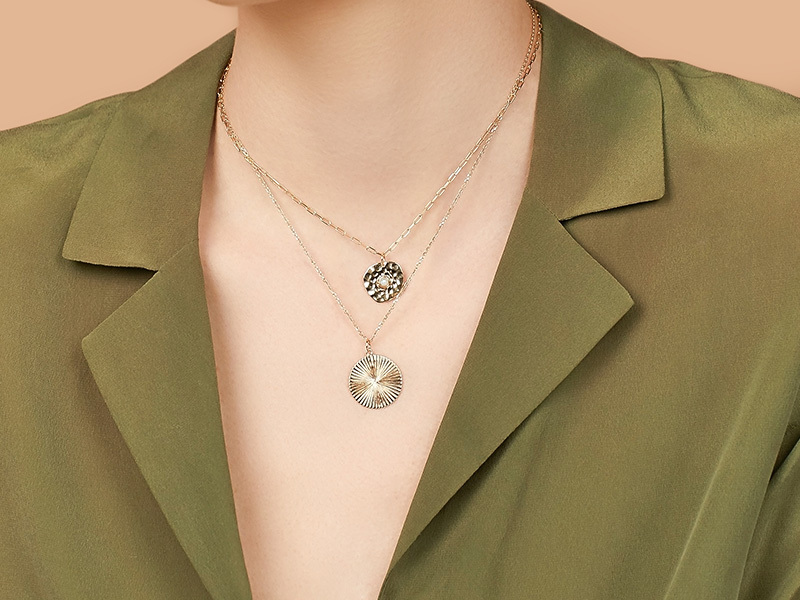 Inspired by nature with a gorgeous and easy-to-match pendant, this coin necklace is ideal to wear with a solid color T-shirt and a pair of tailored trousers. If we had a sun coin necklace, it is only natural to have a star one as well. 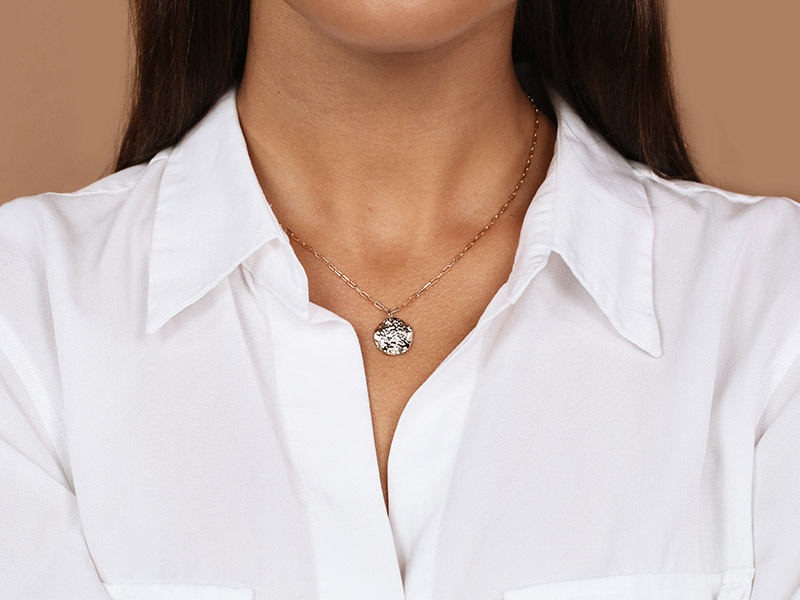 This polished coin jewelry piece features a center cubic zirconia stone that adds a bit of sparkle to any outfit. You can wear it to work, but you can also wear it with a pair of statement earrings to a formal occasion. One of our bestsellers, this chic coin jewelry piece brings a touch of creativity to any outfit. Its lush textured look, subtle sparkle and beautiful link chain are great for women who love to try new trends and take the best of them. You’ve been reading Ana Luisa’s blog long enough to know that layered necklaces are a big trend. Well, guess what? We combined both trends and the result is a stunning coin jewelry piece that you can wear anytime to want to draw attention to your look. With a large sun coin pendant and a smaller moonstone coin necklace. This layered design is simply fabulous. We told you that the coin jewelry trend will translate into different pieces, didn’t we? 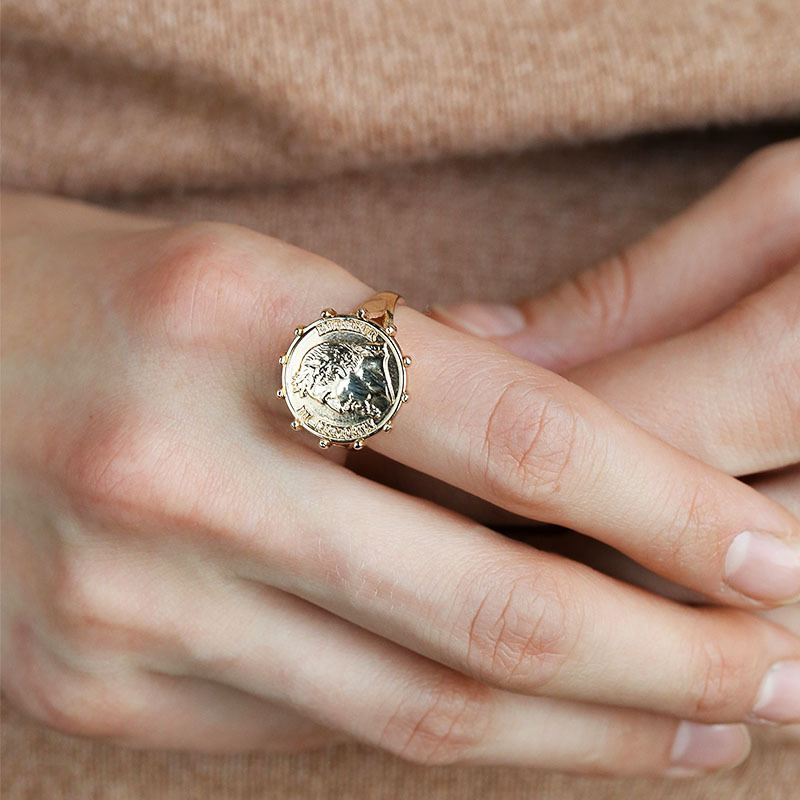 Moving away from the necklaces, take a look at this beautiful coin ring by Ana Luisa. 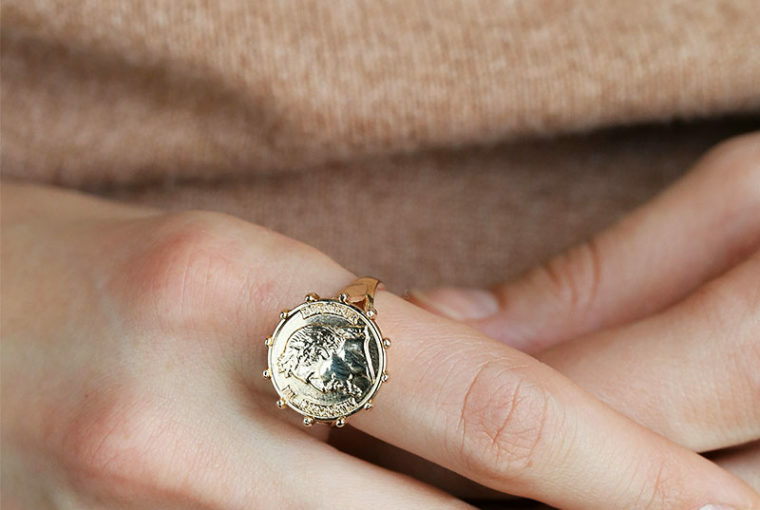 Carefully handcrafted, this gold coin ring is ideal to wear with a coin necklace or in its own. If you are not too big on sets, you can simply pair it with a thin bangle and a pearl pendant. What is great about coin jewelry is that it always offers a nice vintage vibe. It’s easy to accessorize with your favorite vintage pieces but it also works very well with contemporary outfits. In other words, coin jewelry is versatile and elegant. It is the perfect mix that will allow you to add a creative touch to your look. We predict that this trend is only going to grow bigger this year, so it’s time to upgrade your jewelry collection. Curious to find out what other trends this year has in store for you? Or maybe you want to know more about gemstones? Continue on this blog. We publish daily articles with lots of interesting information about jewelry. With our help, you will become a jewelry expert in no time. And since we are sure you can’t wait to check out the coin necklace designs featured in this article, visit Ana Luisa online jewelry shop and find the perfect coin jewelry for your style.